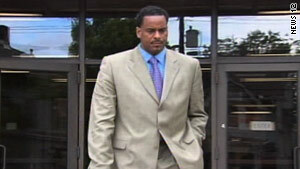 Former NBA star Jayson Williams, in a June 2009 photo, faces at least 18 months in prison after agreeing to a plea deal. New York (CNN) -- Former NBA star Jayson Williams pleaded guilty to aggravated assault Monday in the 2002 shooting death of his chauffeur, according to the New Jersey Attorney General's Office. Under the plea deal, Williams faces a mandatory sentence of 18 months in prison without the possibility of parole. Williams was scheduled to be retried on a manslaughter charge stemming from the shooting death of limousine driver Costas Christofi. Sentencing for Williams is scheduled for February 23. Prosecutors said they will recommend that Williams be sentenced to five years in prison on four charges of attempting to cover up the fatal shooting. He was convicted of those charges in 2004. Williams was tried in 2004 on eight counts, including aggravated manslaughter. A jury acquitted him of three of the more serious shooting counts, found him guilty on four "coverup" charges, and was unable to reach a decision on the second count of reckless manslaughter. The trial judge, Edward Coleman, declared a mistrial on that count, and the state decided to move forward with a retrial on that charge. Williams is free on $250,000 bail with conditions that require him to check in daily with probation officers and not consume alcohol. Williams recently filed a motion to dismiss the charge on which he was to have been retried, arguing that it constituted double jeopardy because the same evidence used at his first trial would be presented at the retrial. However a three-judge appellate panel agreed with Coleman's reasoning that "this isn't really a second prosecution, it is a continuation of the same prosecution." Christofi was shot to death on February 14, 2002, in the bedroom of Williams' plush New Jersey estate. The 55-year-old driver had been hired to drive the former New Jersey Net and several friends to dinner after a sporting event in Pennsylvania. Afterward the group, including four members of the Harlem Globetrotters team, went back to Williams' home. In January 2003, Williams paid Christofi's family $2.75 million to settle a wrongful death lawsuit. Williams, who retired about 10 years ago because of a leg injury, played nine seasons with the Philadelphia 76ers and New Jersey Nets. During his basketball career, Williams was known for his rebounding skills. He averaged 8 points and 12 rebounds per game for the 30 games he played in the 1998-1999 season, according to the National Basketball Association's Web site. Last week, in an unrelated case, authorities charged Williams with one count each of operating a vehicle while intoxicated and operating a vehicle while impaired, the Manhattan District Attorney's office told CNN. Those charges allege that Williams was driving a black Mercedes sport utility vehicle fast when he hit a tree at 3:15 a.m., a New York police spokesman said. William's bail was set at $10,000 and he was ordered by Judge Melissa Jackson to wear a monitoring bracelet.